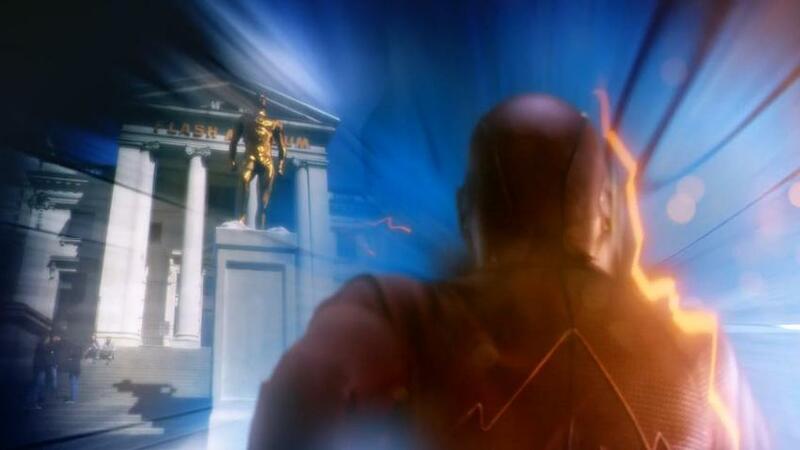 Flash reaches its Season One Finale in a blur of unresolved paradox and spectacularly silly comic book science, but our actors fare pretty well. And they’ve opened a can of wormholes for next season. We learn some version of Eobard Thawne’s plan, and Team Flash make a deal: send Thawne back to his own time and Barry will be able to restore the timeline. His mother will live and his father won’t be in jail. Of course, it won’t be that simple. In fact, it’s so complicated, I’m not entirely certain the writers understand. I certainly have a few questions. The door has been opened to a multiverse, and that could be a good thing. We may well be seeing Jay Garrick next season. Some strong performances raised the episode. I address a couple below, but I want to call attention to Rick Cosnet, who has had too little to do in the past, and gets a great moment this week that could have been awful. He handles it thoughfully. The story plays with that great time-travel question: do we dare disturb what has happened? What will the consequences be? Unfortunately, the ep doesn’t earn either the intellectual engagement or the emotional effect of those questions. Firstly, we’re already in a changed timeline, created by Eobard Thawne, so questions about changing the timeline have been posed by the entire season. Secondly, the episode wants to present the sort of dilemma best-known from Star Trek‘s “The City on the Edge of Forever.” But, whereas “City” gave us a clear, if far-fetched reason to keep a particular timeline intact, The Flash gives us nothing, other than an appeal from his father, who is apparently okay staying in prison, and the notion that Barry’s young mother should be sacrificed because the present looks pretty good. Never mind that Barry became the Flash anyway in some other timeline. Finally, the show’s writers throw away the Grandfather Paradox with a Back to the Future-like disappearance. It seems too easy a way to deal with the death of Eobard’s ancestor. Shouldn’t that change the timeline? Or, at least, if it doesn’t, wouldn’t the consequences of that time-bending death make for a more thoughtful cliffhanger? Originality: 1/6 The episode includes pretty much every time-travel twist ever done, but it doesn’t do them especially well. Effects: 5/6 The episode features a number of effects, generally handled well. Acting: 5/6 The acting is strong this week. Cavanagh makes his character positively Luciferian, while Gustin demonstrates some depth as Barry. Story: 4/6 The story remains fun, but it was a mess. And while I accept comic-book science in a comic-book show, the writers shouldn’t actively go out of their way to make the science ridiculous. On the positive side, the story does not clutter itself with additional villains or threats, as sometimes happens in the DCCWTV-verse. Emotional Response: 4/6 The overall handling of the situation (which may be better-explained next season) muted the response, but a character did get a brave death. Overall: 4/6 Apart from many SF references by Ramon (including one to Hitchhiker’s Guide), the episode teases Hawkgirl, name-drops Rip Hunter, and helmet-drops Jay Garrick. The writers don’t know how to handle time travel. This is not a surprise, few (if any) do. They’ve already established that changing the past is no big deal. (Barry didn’t explode once changed the course of the day he went back in time.) Yes, things change, but the person who is there changing them doesn’t seem to be affected. No one else even notices the change (except Cisco, and he’s *special*). And then we get this. Big SFX time paradox. Possibly also giant wormhole, though we aren’t really shown if that’s a consequence of the paradox or something that would have happened anyway. My low point up until the end would have been “What’s a singularity?” That might have been an important question, but it should not have been asked by Caitlin. Someone else could have asked, or the question could have been answered differently (“You mean a world-eating black hole type singularity? Yep. That wold be bad.”) Caitlin is a genius, working in a particle accelerator. She knows what a singularity is. Still, it was better than Arrow’s finale. I’ll still look forward to next season. Reminds of the time in moment in Contact when someone asks Jodie Foster’s character, an established scientist, if she knows what Occam’s Razor is. Yeah. People have to think through one or two things if they’re going to use time travel as a plot element. They should at least be consistent within the show, if nothing else. As soon as Cisco NEVER made mention of the TARDIS when they “built” the time machine, I knew that there was going to be a complete lack of understanding of Time Travel. how DARE they not have time experts on staff?? Seriously? With all the Whovians out there, other shows have Easter Eggs, but Cisco totally dropped the ball on this one. In the blink-and-you-miss-it category: A brief view of Caitlin as Killer Frost as Flash was running. I called the ending in the first five minutes of the episode but I wasn’t sure they’d go that far, and then they did. My biggest problem with it all was: If Eobard Thawn never existed, how does this timeline exist at all? Or perhaps that’s what the singularity is all about. Great! I spotted the Flash Museum, but missed the Killer Frost. I think 28/42 is way low. This was one of the best season finales I’ve seen. I don’t think the originality was that bad, either. Yes, time travel has been done, but they didn’t just gloss over that. And time travel was not the only thing going on in the episode, so judging it so harshly based on that is a bit. Uh. Harsh. Effects was easily 6/6 or even more (this is a TV show, and the SFX were well into movie quality), and emotional response… if you didn’t automatically 6/6 it after the scene with Barry’s mom, you should have a doctor check your heart for signs of calcification (: Honestly it almost looks like you’re really mad at this episode because it kicked your puppy or something. My low points are, as pythor pointed out, Caitlin asking what a singularity is (I mean really?) and as usual some of the Science/Tech Talk was way the hell off (“It’s like a tornado except upside down!” oh and also it’s nothing like a tornado). I’m not a fan of time travel paradoxes, but at least this one ended with the universe trying to eat itself. See, Barry’s mom being dead as a backstory is fine. But you have to earn emotional points if you revisit that death, by demonstrating that, say, they had a relationship, that she was a good woman, et cetera. Otherwise, it’s just a fridging to push our emotional buttons. However, many people like this episode, and my review does identify some good pints. I’m very curious where they go with this singularity, but I stand by my issues regarding how they got there.